Core Values of Living Hope Ministries. Living Hope Ministries is committed to encouraging those who are taught and touched by the ministry, to build strong and deep personal relationships with the Lord Jesus Christ. All the people we work with are friends, not contacts, and our service for Jesus is greatly enhanced by our being in good relationship with one another. We honour marriage as taught in Scripture. Marriage is to be safeguarded in every way and is a powerful picture of the relationship between Christ and his church. Holiness and purity are hallmarks of that relationship. We believe valid Christian ministry comes out of a serving heart. People working with us must not be empire builders in any sense but servants of the Lord Jesus. Local churches need to be led by godly leaders, whose vision is clear to build God’s church not theirs! Seminars, TV, Radio, Bible Studies, Prayer and Fellowship are all provided to achieve that goal. 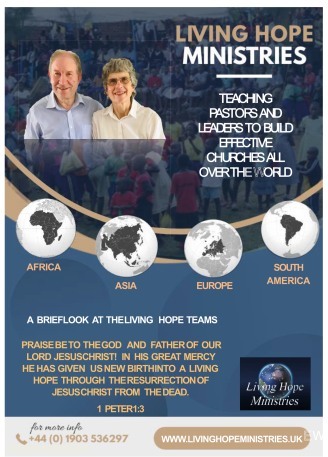 Living Hope Ministries serves very poor people in other countries, but in no sense do we want to adopt a colonial style. Rather, we count it always a privilege to work with God’s people in whatever economic state they find themselves. Living Hope Ministries was called by God to train and equip leaders – teaching them to build churches that reflect the New Testament model. We recognise the many practical and material needs that are faced by these leaders and we help where we can. However, this can never be at the expense of our goal to train and equip God’s servants, to establish churches that honour Jesus.